(Canada Mayflower (Maianthemum canadense) - 01) Canada mayflower is a native to the sub-boreal conifer forests in Canada and the northern United States, from Yukon and British Columbia east to Newfoundland and south to Nebraska and Pennsylvania, and also in the Appalachian Mountains to northern Georgia. 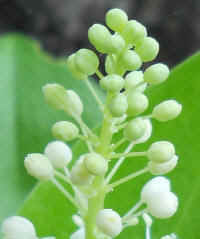 Including the bloom, it grows to heights of from 3 to 9 inches and has 1 to 3 leaves. 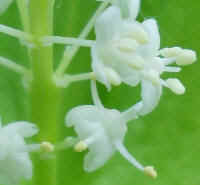 (Canada Mayflower (Maianthemum canadense) - 01a) By zooming in on these tiny 1/8 inch Canada mayflowers, we can see that each one has 4 petals, 4 stamens, and 1 pistil. 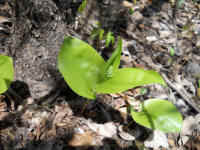 (Canada Mayflower (Maianthemum canadense) - 02) In this photo, we can see other Canada mayflowers with only one leaf. 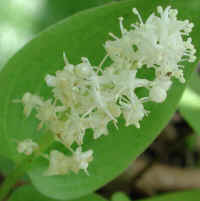 They begin to bloom in May (hence their name), and can bloom as late as July. 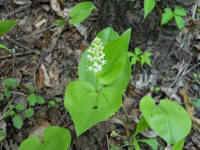 (Canada Mayflower (Maianthemum canadense) - 03) The Canada mayflower has a flowering single stem from which the broadly heart-shaped to oval or pointed leaves grow. 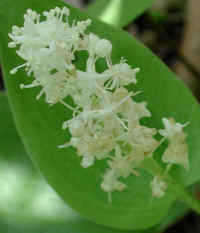 There can be between 12-25 starry shaped flowers on the flowering stem, which will also have 2-3 leaves. 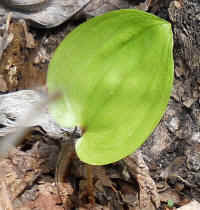 The single leafed plants do not have a flowering stem. 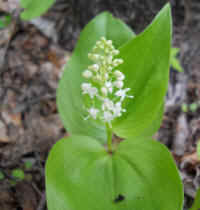 (Canada Mayflower (Maianthemum canadense) - 04) This is another view of the Canada mayflower. 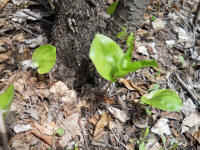 In in background, we can see poison ivy growing on the tree. 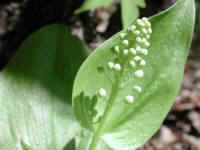 (Canada Mayflower (Maianthemum canadense) - 04a) In this close up photo, we can see the buds of the Canada mayflower in progressive stages of development from top to bottom of the flowering stem. 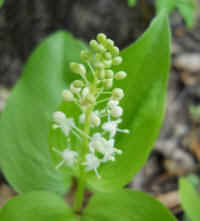 (Canada Mayflower (Maianthemum canadense) - 05) This is another look at the flowering stem of the Canada mayflower. 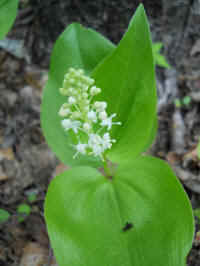 (Canada Mayflower (Maianthemum canadense) - 06) This is another view of the Canada mayflower. 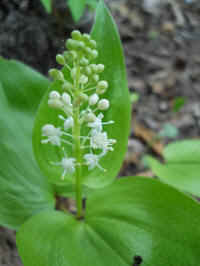 (Canada Mayflower (Maianthemum canadense) - 07) This is another look at the Canada mayflower. 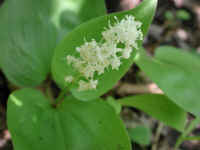 (Canada Mayflower (Maianthemum canadense) - 08) This is a closer look at some of the tiny 1/8 inch flowers of the Canada mayflower. (Canada Mayflower (Maianthemum canadense) - 08a) This is a bee's eye view of one of the tiny 1/8 inch flowers of the Canada mayflower. 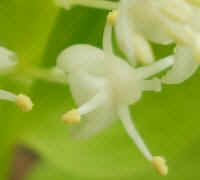 In this extreme close up, we can see why these tiny flowers are referred to as being star-shaped: note that the 4 petals of the flowers fold back away from the ovary, instead of cupping around it or above it, which makes the 4 stamens with their pollen grains, and the open ended pistil show predominately, and looking somewhat like a starburst. 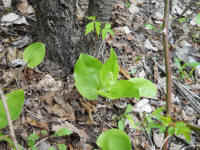 (Canada Mayflower (Maianthemum canadense) - 09) In the center of this photo is a newly budding Canada mayflower with 3 leaves, and to the sides, we can see single leaved plants that will not bloom. 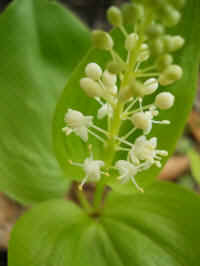 (Canada Mayflower (Maianthemum canadense) - 09a) As we zoomed in on this Canada mayflower, we could clearly see that the three leaves grow alternately along the stem below the bloom. 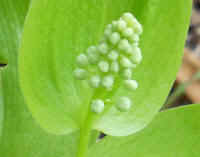 It is also interesting to view the tiny hairs growing along the veins on the underside of the leaves, which can be seen in the top leaf which is still partially wrapped around the budding bloom at the top of the stem. 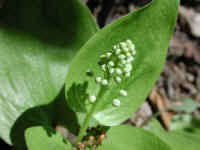 (Canada Mayflower (Maianthemum canadense) - 10) This is another look at the budding Canada Mayflower. 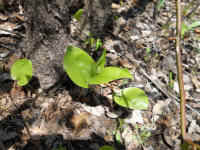 (Canada Mayflower (Maianthemum canadense) - 11) In this photo are three Canada mayflower plants: two single leaved non-blooming plants, and one three-leaved blooming plant. (Canada Mayflower (Maianthemum canadense) - 11a) This is a closer look at one of the non-blooming, single-leaved Canada mayflowers. 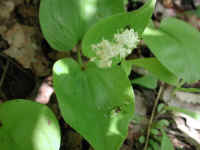 (Canada Mayflower (Maianthemum canadense) - 11b) This is another single-leaved, non-blooming Canada mayflower. (Canada Mayflower (Maianthemum canadense) - 12) This is another look at Canada mayflowers growing on the woodland floor. 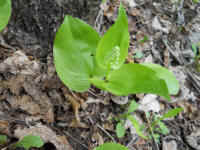 (Canada Mayflower (Maianthemum canadense) - 13) This is another look at the budding Canada mayflower. 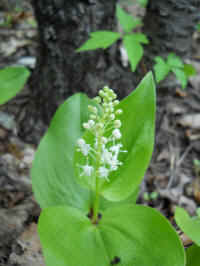 (Canada Mayflower (Maianthemum canadense) - 14) This is another look at the Canada mayflowers. 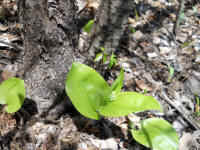 (Canada Mayflower (Maianthemum canadense) - 15) In this photo, we begin to see the buds on the blooming stem of the Canada mayflower began to expand and separate from bottom to top. (Canada Mayflower (Maianthemum canadense) - 15a) This is a closer look at the blooming stem of the Canada mayflower as the buds begin to expand and separate. 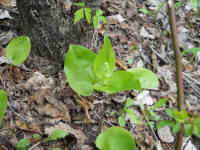 (Canada Mayflower (Maianthemum canadense) - 16) This is another look at a budding Canada Mayflower. 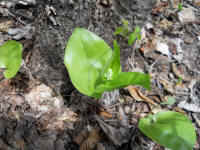 (Canada Mayflower (Maianthemum canadense) - 17) This is another look at the budding Canada mayflower. 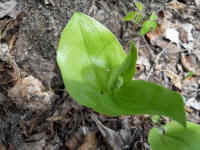 (Canada Mayflower (Maianthemum canadense) - 18) This is look at the developing buds of the Canada mayflower. 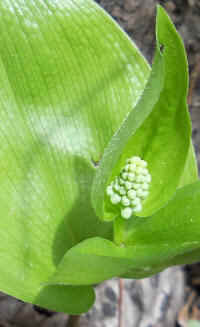 (Canada Mayflower (Maianthemum canadense) - 19) This is another view of the developing buds on the blooming stem of the Canada mayflower. (Canada Mayflower (Maianthemum canadense) - 20) This Canada mayflower is in full bloom. We spotted it in the woods just a few feet off our driveway. (Canada Mayflower (Maianthemum canadense) - 21) This is a little closer look at the blooming Canada mayflower. (Canada Mayflower (Maianthemum canadense) - 22) This is a bee's eye view of the Canada mayflower bloom. 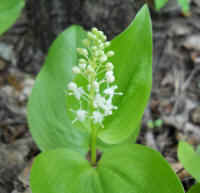 (Canada Mayflower (Maianthemum canadense) - 23) This is another look at the bloom of the Canada mayflower.